After less than five years publishing, we’re in the top three overall in digital news with legacy media. AFTER A LITTLE less than five years in existence TheJournal.ie is now the most frequently read online-only news publication in Ireland. The finding was delivered in the Reuters Institute’s Digital News Report for 2015. While the Reuters Digital Report is an annual event, this is the first year in which the uptake of Irish digital media has been put under the microscope. RTE and the Irish Independent Online are currently numbers one and two in terms of weekly usage for online news by those surveyed with 31% and 28% of user share respectively. TheJournal.ie and Irish Times online are joined in third place with 23%. TheJournal.ie is the only online-only news source to achieve a place in the top three. “This year we find more compelling evidence about the central role being played by smartphones and a sharp increase in the use of social media for finding, sharing, and discussing the news,” said Dr David Levy, director of the Reuters Institute. We see significant growth in the use of online video and new visual formats and track the global rise of Buzzfeed and the Huffington Post, companies that have become masters at creating and distributing content in a social and mobile world. Internet penetration in Ireland at present stands at 79% of the population. Online now stands as the greatest source of news in Ireland with 41% of those surveyed seeing it as their prime resource. TV is second highest in Ireland with 37%. Printed newspapers bring up the rear with just 6% of users seeing print as their primary source of news. 52% of Irish smartphone users now use their device to access news. Social media is now seen as being more important than print news, particularly with the under-35s. 22% of Irish consumers use just one digital source for their news, while 20% of us use four or more sources to access news content. Ireland had the joint rate of smartphone use (32%) internationally for users accessing the majority of their news there. Facebook is the most popular social network in Ireland and is seen as playing a central role in protest campaigns here, the movement against the introduction of the water charges being a case in point, while Irish journalists are among the heaviest Twitter users in the world. Just 7% of the Irish surveyed are paying for online news. Finland has the highest such penetration with 14%. 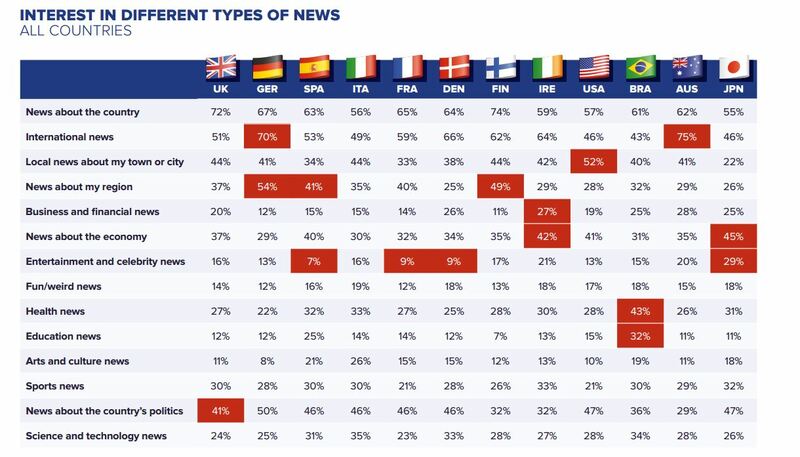 46% of Irish readers have trust in the news with which they are provided (placed 6th of the 12 countries considered). 71% of Irish readers have interest in the news. 49% of the Irish who were surveyed said they now use social media as a source of news. Surprisingly the worst performing country from this point of view is traditional tech powerhouse Japan with just 21%. Brazil has the greatest uptake in social media as a news source with 64%. 31% of the Irish people surveyed now see online portals as the most accurate source of news, second only to TV (37%). Across the range of countries surveyed, trust in news sources rises with age – the greatest level of trust being seen among the over-55s. 73% of those aged 55+ have bought a print newspaper in the past week. The figure is just 24% for those aged under 35. News about Ireland and international news are the most dominant interests among readers in Ireland. Business/finance and news about the economy are also subjects that stimulate news-consumers here to a large extent. 43% of Irish news-users are now mainly digital users, with 23% sticking to traditional broadcast and print forms of media. 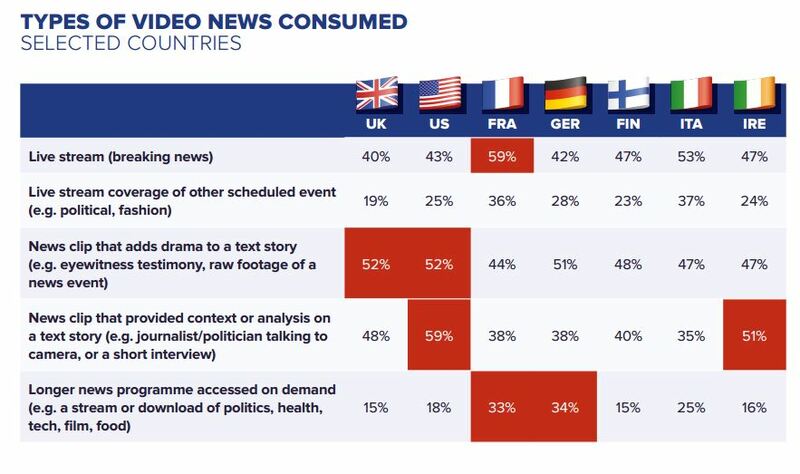 Video is still being used very differently in the different countries surveyed. In Ireland, video is seen as most useful from an analytical, bite-size point of view. Meanwhile, the intensely participatory nature of online news (sharing, commenting etc) is clearly reflected in the study’s findings. Ireland has an 80% participation level when it comes to the news in 2015. Likewise, some 25% of users polled said they actively comment on news stories as they develop. All findings reported here are presented in Reuters’ Digital News Report for 2015. The data presented the results from a comprehensive online questionnaire into news consumption in 12 different countries by the Reuters Institute for the Study of Journalism. Some 1,501 Irish people filled out the questionnaire behind the report’s findings in February 2014. The report itself has been published annually since 2012. Read: Is this American billionaire’s company about to buy TV3? Email “TheJournal.ie is now the most-read online-only news resource in Ireland”. Feedback on “TheJournal.ie is now the most-read online-only news resource in Ireland”.